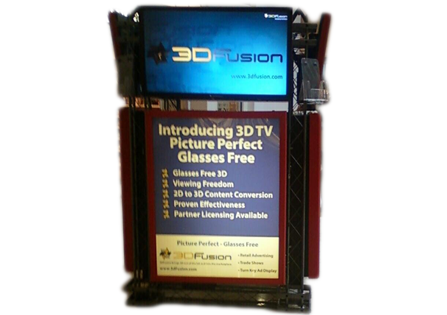 Designed to operate 24/7 this self contained portable Advertising Kiosk stops shoppers in their tracks as they become captured by the 3D stereoscopic Ad video clips. The Visual 3D impact range is from 4 to 20 feet under current design parameters. The four sided Kiosk houses four Lite Boxes designed for Print media film or paper 2D traditional Ad content. Kiosks are available as single and two side platforms. Contact Rembrandt 3D for details..
All units are constructed of steel and fire retardant safety code materials, the unit stands 7’ tall by 53” on a side. Unit specifications and custom designs are available upon request.